As a designer, you have the entire web design process nailed down to a T. You have a handy checklist of all the pages you need to design so nothing is forgotten. Or maybe not. I’m willing to bet you’re forgetting some commonly overlooked pages. How do I know? Because I forgot them too. They’re not the fun, obvious pages that every person thinks of (i.e. the home, about, contact, and blog pages). THey’re pages that are often hidden, but are crucial to a positive user experience. So what are they? 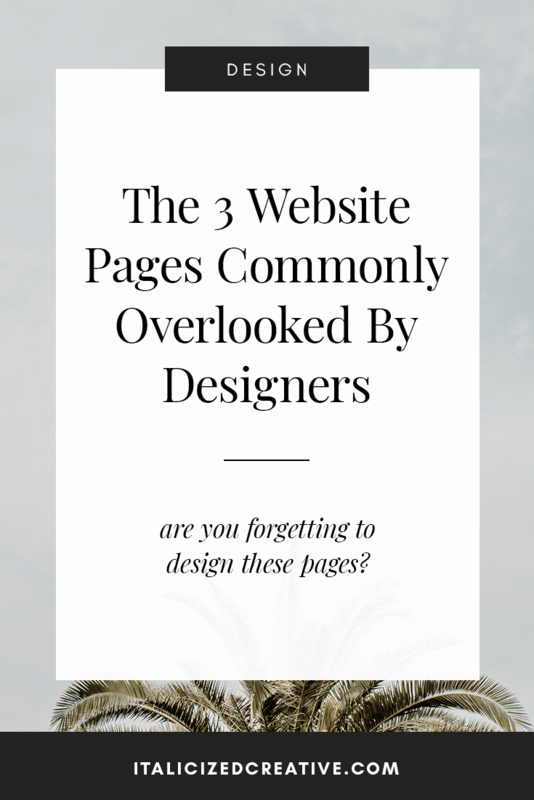 Keep reading to learn the 3 website pages commonly overlooked by designers. Have you given any thought to the design of the category and tag pages? If not, I totally get it. Themes usually display categories the same way as the blog page. And depending on the site, that’s fine. For example, if your client has a fashion blog, a standard blog layout is probably fine. But if you’re designing a site for a business owner who educates on their blog, that format may be less than ideal. The key is to think about the end user and how they’ll be using the page. They’ll probably be browsing a particular topic because they want to learn more. Therefore, they want to be able to quickly see everything a site has to offer on that topic. Displaying 5 full posts per page isn’t going to help in that goal. Instead, a much better solution may be to create a grid or list that has the blog title and a short excerpt. A page like that is quickly skimmable and will get the user the content they want right away. So think about the type of content a site has and how the user will be browsing. What would make them click over to a category page? What are they trying to find? How else can you help them? You’ve added a search bar, so that should be enough, right? Wrong. Search doesn’t stop at entering a keyword into the search bar. User experience really comes into play when the user is viewing the search results. By default, most themes will come with a standard search results page. But I often find that they’re lacking. They usually take on the blog page template and just spit out any blog posts that match it. Not exactly a good experience. That’s why it’s so important to design a search results page that has the end user in mind. When they land on a search results page, what are they looking for? How should the content best be laid out? And what are their next steps? When someone lands on a 404 page, it’s because they were looking for something that doesn’t exist. If your 404 page just tells them it doesn’t exist, what good is that? They’ll quickly click away and not give your client’s site another thought. Again, most themes come with a default 404 page and some are better than others. Before you hand over a project, make sure that the 404 page is helpful. Does it give the user the option to search for what they’re looking for? Does it give users a reason to stay on the site and keep clicking? Don’t just brush the 404 page under the rug. This is the perfect opportunity to extend the site’s user experience even further. By creating custom category, search results, and 404 pages for your clients, you’ll be designing websites that create amazing user experiences for your clients. Remember, it’s the little details that really make the design!